With the growth of the People’s Liberation Army Navy (PLAN), and growing Chinese assertiveness over territorial claims as well as seeming blue-water naval aspirations, there has been a corresponding increase in media coverage on the People’s Republic of China’s (PRC) military capabilities. As stated in earlier parts of this series, the confusing and often-inaccurate information on the technical aspects of China’s armed forces, and in this particular case the PLAN, makes meaningful debate difficult. One especially troublesome example is the inadequate reporting on China’s anti-ship cruise missiles (ASCM), and more specifically the Ying Ji-8 (YJ-8) or Eagle Strike-8 family. The purpose of this series of articles is to conduct a critical review of the available evidence to sort out the correct identity of the members of the Eagle Strike-Eight anti-ship cruise missile family, as well as providing accurate characteristics and performance data. In Part 1 of this three-part series, designation confusion, as well as the first two members of the family – the YJ-8 and YJ-8A – were covered. Part 2 addressed the YJ-81, YJ-82, and C802 missiles. The YJ-83 showed up on the scene without any advance warning, but even during its so-called début at the National Day Military Parade in Beijing in October 1999, no actual missiles were shown. The trucks that rolled by only sported two of the launch containers on their flatbeds – containers that were also used by YJ-8A missiles. Almost immediately, wild claims as to the YJ-83’s performance began showing up on Internet blog sites. Published largely by enthusiastic Chinese nationals, the claims of supersonic speeds, GPS guidance, and a ship-to-missile data link were made repeatedly. As photos of missiles with the YJ-83 designation stenciled on them started showing up on Internet sites, questions were raised about the performance claims. The visible configuration of the missile just didn’t support what was being said online. And yet, despite the lack of any solid evidence to support the speculative claims, many Western defense journalists accepted them as gospel, and articles proclaiming China’s unexpected rapid advancement became the norm. Even after some Chinese blog site moderators began raising flags that much of the hype concerning the YJ-83 was unfounded, the content of Western books and articles remained largely unchanged. The development of the YJ-83 is somewhat blurred as it is closely linked with the C802. A rough estimate is that the technical design was probably locked down as soon as the Chinese were confident the C802 would fly. This lone criterion suggests the design for the YJ-83 was frozen sometime between 1993 and 1994. Several Western sources reported that the new missile entered service in 1994, but hindsight now indicates that this was when the final design was likely approved. The choice of the TRI 60-2 turbojet essentially defined the YJ-83’s size and aerodynamic form. Measurements of broad aspect photos of missiles with the YJ-83, C802A, and C802 designations all show them to be essentially the same. According to CPMIEC brochure data, the C802A is actually nine millimeters shorter than the original C802, a trivial difference. All other dimensions are the same. With the propulsion plant fixed, and the warhead design largely the same, only about 25% of the YJ-83 missile’s subcomponents were open for significant improvement. Fortunately, those subcomponents were predominantly electronic in nature. The early YJ-8/8A missiles used hybrid computers for the navigation, autopilot, and radar seeker. A hybrid computer uses a mixture of digital and analog components – that is solid-state elements along with servos, relays, and vacuum tubes. It is interesting to note that only the radio altimeter was fully digital, comprised of solid-state components only, which reflects the likely direct influence from the revolutionary French MM38 Exocet missile. The inertial reference unit used small mechanical gyros and accelerometers that feed their input to the autopilot computer. Servomechanisms transmitted the steering commands to the four independent rudders. While the Chinese were satisfied with the YJ-8/8A’s overall performance, the electronic and navigation components were very bulky and took up a considerable amount of space inside the missile’s fuselage. By transitioning to all digital, microprocessor based computers, and a more compact strap-down mechanical inertial reference unit; the YJ-83 had more internal volume available for fuel and a slightly larger semi-armor piercing warhead (190 kg vice 165 kg). These changes increased the maximum range of the YJ-83 and its export variant, the C802A, from 120 km to 180 km. With a well-established airframe and mature propulsion plant already in place, the YJ-83 benefitted from an exceptionally short development timeline and began flight-testing in 1997. Apparently the missile passed through its trials quickly, as it was reported to have reached IOC in 1998. It was formally announced in October 1999 at the National Day Military Parade, and it has slowly worked up to become the dominant ASCM in the PLAN inventory (see Figure 9). The C802A export variant, shown in Figure 10, wasn’t displayed until the DSEi 2005 arms show in London, England. The seven-year delay was likely due to production limitations, and the more urgent need to replace YJ-8A missiles on the PLAN’s warships. The information presented by CPMIEC C802A brochures since 2005 go a long way toward defining the capabilities of the YJ-83 more accurately. In regard to maximum speed, the YJ-83 is most definitely a subsonic missile. The TRI 60-2 turbojet is unaugmented, i.e. no afterburner, and is only capable of speeds up to Mach 0.9. In fact, in the 1990s there weren’t any small turbojets with the ability to support supersonic speeds. The first time an engine with this capability is mentioned is in a 2008 American Institute of Aeronautics and Astronautics conference paper, a historical overview of Mircoturbo SA’s engines, which stated the TRI 60-5+ turbojet first demonstrated supersonic flight capability in 2007. From a drag perspective, the rounded blunt nose of the YJ-83 is highly inefficient for supersonic flight. Since the effects of the shock wave on the nose dominate supersonic drag, the missile’s overall drag coefficient is heavily influenced by the nose cap’s fineness ratio (length of the nose cap divided by its diameter). The YJ-83 nose has a rather low fineness ratio, thus its drag coefficient would be approximately twice that of a missile with a sharper, more pointed nose such as the one on the 3M-80 Moskit (SS-N-22) family at speeds between Mach 1.5 and 2.0. Higher drag requires more thrust to maintain speed and would dramatically increase fuel consumption, thereby greatly reducing the missile’s range. Another related problem is the turbojet’s scoop inlet. It is a fixed geometry inlet that is by design optimized for a very narrow speed range. Operating away from that design point incurs a non-trivial loss in engine performance. Furthermore, the inlet face is completely flat, which would make it even less efficient at supersonic speeds as it lacks an upper diverter to isolate the inlet from shockwave interactions with the boundary layer near the missile’s body. Finally, the scoop inlet of the YJ-83/C802A is identical to that on the C802, and similar in design to the scoop inlet on the C602 and C705, all known to be subsonic missiles. All of these observable features strongly point to the inlet design being optimized for subsonic airflow. Combining the technical limitations of the turbojet, nose cap, and scoop inlet makes it all but impossible for the YJ-83/C802A to be supersonic. And it should be no surprise at all that the CPMIEC brochure lists the C802A’s maximum speed as Mach 0.8 to 0.9 – identical to the earlier C802. The YJ-83 has often been described as having the ability to use the Global Positioning System (GPS) with its inertial navigation system to improve its accuracy. This claim is also unsupportable. The first GPS-directed ordnance was the U.S. Joint Direct Attack Munition, or JDAM, a free falling bomb with an integrated inertial navigation system (INS) and GPS receiver. JDAM began flight-testing in 1996 and reached IOC in 1998. A B-2A stealth bomber first used the JDAM operationally during Operation ALLIED FORCE in the spring of 1999. An in depth Chinese technical paper, published in 1995, stated that Chinese scientists and engineers were well aware of the benefits that GPS could provide to both manned aircraft, as well as weaponry. But there were technical limitations that had to be overcome before they could be implemented in Chinese systems. By the time the JDAM reached IOC, the YJ-83 was at the end of its flight-testing phase and was about to enter IOC itself. To even consider replacing the mechanical strap-down INS with one using ring laser gyroscopes, an integrated GPS receiver, and a dedicated computer would have delayed the introduction of this missile for at least five years, as China was still in the research and development stage of an indigenous ring laser gyro and GPS receivers had to be obtained from outside the country. And of course, since the GPS was an American system, there would always be concerns about the accuracy of the satellites’ signals. Programmatically, a decision during the 1994 – 97 timeframe to include a GPS feature in the YJ-83 would make little sense. Indeed, senior Chinese military leaders seem to show more discipline then their Western counterparts in regard to requirements creep with defense acquisition programs, and in this case they would move any satellite navigation requirement on to the next missile in an earlier stage of development. This requirement would also be tied to the development of the indigenous Beidou system that first went operational, with a limited regional capability, in 2000. In looking at the CPMIEC brochures for the C802A, there is no reference to GPS as part of the navigation system. It is, however, explicitly stated as a feature in the C602 brochures (the PLAN version is the YJ-62) that reached IOC in 2005. A similar argument can also be made against the data link claim. Prior to the late 1990s, only the very large Soviet ASCMs of the SS-N-3 and SS-N-12 families, and the Franco-Italian Otomat had a limited ship-to-missile data link capability. In 1997, both Israel and the U.S. were well along with their respective Harpoon improvement programs. The U.S. Harpoon II under went its first test flight in 2001, while the Israeli Harpoon Extended Performance (HAP) program was completed around the same time. Both missiles included a full two-way data link and an integrated INS/GPS to improve targeting in littoral environments cluttered with civilian shipping. Again, incorporating a command data link this late in the YJ-83’s development would have incurred significant delays. In addition, articles discussing such an advanced data link assume highly accurate navigation information; implicitly suggesting an integrated INS/GPS navigation capability is required. The CPMIEC brochure on the C802A doesn’t mention a data link as one of the missile’s features. In fact, it is quite the opposite as the brochure explicitly states the C802A is a “fire and forget” weapon. There are three YJ-83K-based land attack missiles with a command data link, two versions of the KD-88 (one electro optic and the other probably IR-guided) and the electro optical homing CM802AKG. These missiles all showed up much later than the YJ-83. The first Internet photos of the electro optical version of the KD-88 were posted in 2006, while the CM802AKG made its initial appearance at the Zhuhai Airshow China 2010 exposition. For the earlier KD-88 missiles, the data link antennas are clearly visible on the missile’s wings. In the case of the CM802AKG, the display mock-up lacked the wing-mounted data link antennas, however, a Chinese news article covering the 2010 Zhuhai show contained a summarized interview with an unidentified CM802AKG designer who explicitly stated that a data link had to be added to the missile. When combined, all these points rule out the possibility of a data link in the YJ-83. But if this is true, how does one explain the reported attributes of adaptive mission planning and post-launch maneuvers? Again brochure data helps close this loop. In the CPMIEC 2010 C802A brochure, route planning using waypoints is described for the first time. The missile system is capable of storing four different attacking paths with a maximum of three waypoints each. This enables a single ship to launch a multi-axis attack, a significant improvement over the limited range of launch bearings of the earlier YJ-8 and C802 missiles. For years, the YJ-83 has been tied to the C803 designation. This linkage is based on a flawed assumption that the YJ-81 is the C801, the YJ-82 is the C802, and therefore, the YJ-83 must be the C803. As has been shown throughout this article, this naming convention is incorrect. The export version of the YJ-83 is the C802A, but there is so much reporting on the C803 that it must be dealt with separately. The air-launched version is the YJ-83K and, as one would expect, the export variant is the C802AK (see Figure 11). As for the submarine-launched version, a missile with the YJ-83Q designation hasn’t been seen; nor is it likely it ever will be. Figure 11: The YJ-83K is the air launched version of the YJ-83, as denoted by the “K” at the end of the designator. The missile in the photo is a training version without the side cable runs. The export variant is the C802AK as shown next to a Pakistani JF-17 fighter-bomber at the Dubai Air Show in 2011. Indigenously designed and built Chinese submarines have torpedo tubes that are about the same length as Western submarines. A review of Chinese torpedoes shows that they are less than seven meters in length, over a meter shorter than Russian weapons. This puts the torpedo tubes on the Song (Type 039), Yuan (Type 041), Shang (Type 093) and others at about 7.1 meters in length. This assumes an additional 0.25 meters clearance on top of the 6.8 meters of the Yu-4 torpedo with a wire dispenser. The Yu-6 looks to be a little shorter, about 6.5 meters long with the torpedo mount dispenser for the wire. Going back to the earlier discussion, recall that the YJ-82 capsule is about 6.1 meters long, and this is for a YJ-8-size missile without the booster. If the booster were added, the capsule would be at a minimum 7.3 meters long, probably closer to 7.5 meters as the heavier missile would likely require some additional buoyancy to ensure it reached the surface. Both the C802 and YJ-83 start out at almost 6.4 meters in length, and both missiles must have the booster to operate properly – there is no option with this, as the turbojet can only start when the missile is under powered flight. Using simple ratios, this makes the capsule length of a C802 or YJ-83 missile on the order of eight meters, far too large for the probable torpedo tube length of approximately 7.1 meters. Rumors of a YJ-83 submarine-launched variant being developed are based on speculation that doesn’t take into account the limitations of the potential launching platforms. In addition, the 2011 U.S. Department of Defense’s annual report to Congress on China’s military developments stated that a new long-range submarine-launched ASCM, with the NATO designation CH-SS-NX-13, was under development for the Song (Type 039), Yuan (Type 041), Shang (Type 093), and the future Type 095 SSN. If this ASCM were a variant of the YJ-83, it would not have an entirely new NATO designation. The YJ-83, being a variant of the C802, would share a similar NATO designation and nickname. Since the C802 is the CSS-N-8 Saccade, the CH-SS-NX-13 designation (note the change in designator format) explicitly shows the U.S. government believes it is a new weapon. Since about 2002, the “C803” designation has worked its way into just about every Western naval systems book and article. And yet, in over ten years of reporting there has been no formal evidence to support its existence. If one examines the brochures, placards, and mockup displays that CPMIEC has put up at the various arm shows throughout the years, nowhere will the designation “C803” be found. Never. For example, Figure 12 shows a flat screen display at the CPMIEC booth at the Airshow China 2010 expo. The display lists, by range, all the ASCMs that China had on the market – the C701, C704, C802, C705, C802A, and the C602. Furthermore, there was a full mockup display of each of the above missiles on the exhibition hall floor, as well as a smaller scale model. A missile with the “C803” designation was conspicuous by its absence. The recent Zhuhai Airshow China 2012 also lacked any mention of the C803, even though numerous new missile variants were presented to the public for the first time. That is because the “C803,” if it exists at all, is likely still in the developmental stage, probably in early flight testing, and isn’t ready to be marketed. Figure 12: CPMIEC display at Airshow China 2010. 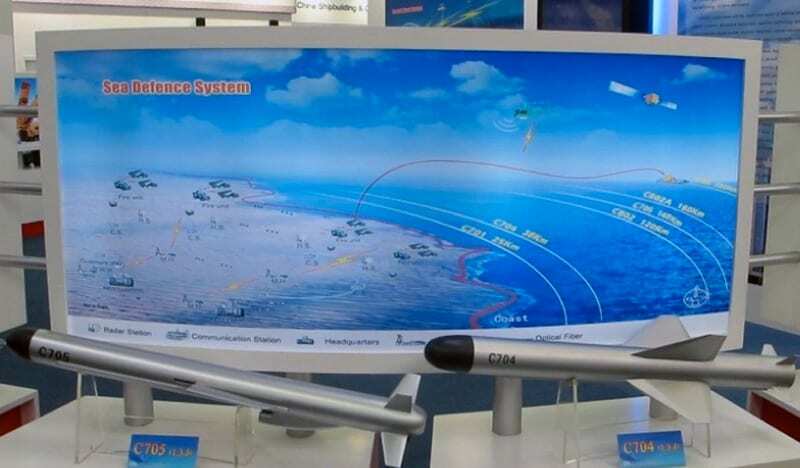 The C803 is not even mentioned on the screen with other Chinese anti-ship missiles offered for sale. If the high performance attributes that have long been ascribed to the YJ-83 are actually for an entirely new advanced missile, a program start date can be roughly estimated by looking at when Western and Chinese-based media sources first started reporting on these capabilities. A quick review of the primary Western references indicates these attributes were first described around 2001-2002. Chinese blog sites, as well as the Kanwa Defense Review, started to mention these capabilities in late 1999. If this new missile began development between 1999 and 2002, then the integrated INS and satellite navigation system (GPS and Beidou) and the command data link would now be within China’s technical capabilities. However, a small supersonic capable propulsion system would undoubtedly still be the most challenging aspect. Early on, the “C803” was initially described as a supersonic missile throughout its entire flight. The problem with this is that the new missile couldn’t possibly go 200+ km at supersonic speeds and still fit in a torpedo tube; all existing missiles with these speed and range characteristics are much larger than any torpedo tube ever built. The “smallest” missile is the Russian 3M-55 (SS-N-26) Onyx/Yakhont at 0.67 meters in diameter and 8.9 meters long, not including the launch canister. Given that the U.S. Department of Defense’s report explicitly stated the CH-SS-NX-13 is to go on all classes of modern Chinese attack submarines, it is either a torpedo tube-launched weapon, or every PLAN submarine in the Song, Yuan, Shang, and Type 095 classes would have to be fitted with external launch tubes – a significant modification for the vast majority of these submarines. This would be tremendously expensive, not to mention occupying most of the available submarine construction way space for years. In short, fitting existing submarines with external tubes for a large supersonic missile seems totally unreasonable from a programmatic perspective. It also completely skips the PLAN’s proven acquisition concept of buy some, study thoroughly, then build our own, and is fraught with technological risk. With the recent memory of the unsuccessful YJ-1/C101 and HY-3/C301 large supersonic ASCM programs still fresh in the PLAN leaderships minds’, neither missile was formally accepted into service, it is highly unlikely they would try to go down this path again. By the mid-2000s, there was a noticeable change in regard to the “C803’s” speed. Chinese blog sites, and some Western sources started questioning the all-supersonic flight profile, and shifted to a subsonic cruise mode followed by a supersonic terminal attack. This change eliminates the problem of requiring a large missile to meet the 250 km range figure that most of the blog sites coalesced about. If one accepts the premise that the missile had a subsonic cruise mode, with a supersonic terminal attack, then this narrows down the possible propulsion system options considerably, as there is only one ASCM in the world that can do this – Russia’s 3M54 Novator Alpha (SS-N-27). Recall that Mircoturbo only demonstrated a supersonic flight capable small-scale turbojet in 2007; this would be rather late in the design stage for this missile and there is no reason to believe China could count on such a development six or so years earlier. However, China had signed a contract with Russia for eight Project 636M Kilo class submarines with the ability to fire the export Novator Alpha (3M54E/SS-N-27B) in May 2002, with the first submarines and SS-N-27B missiles being delivered in 2005. It is likely Chinese engineer’s had access to detailed design documentation for both the submarine and the missile after signing the contract, and this timing corresponds roughly with the first rumors of China developing a new advanced ASCM – one that the U.S. Department of Defense’s 2010 and 2011 annual reports stated was in “development and testing.” While admittedly speculative, and based largely on coincidental inference, there is at least some basis to suggest that the new CH-SS-NX-13 ASCM may be a modified Chinese copy of the Russian Novator Alpha, a very different missile from the YJ-83. It’s been a long haul, but with all the data and discussion completed, Table 1 can now be rebuilt and the confusion eliminated. Table 2 lists all the missiles in the YJ-8 family with their correct PLAN and export designations properly linked, along with their performance characteristics. Those entries with an “est,” indicate that the number is the author’s estimate and not information found in official brochure data or published articles. With regard to the YJ-82, the maximum range has been reduced to reflect the fact that the sustainer rocket motor has to do the booster’s job as well. Table 2: Eagle Strike-8 missile family designation and characteristics data. There has been much confusion in published works and on blog sites regarding Chinese ASCMs in general, and the YJ-8 family in particular. It is also fairly safe to say that the confusion is probably not the result of a dedicated deception program; rather it is due to an overload of information, courtesy of the Internet, coupled with a lack of basic engineering expertise by many of the participants. China has had a flurry of activity in their ASCM programs over the last 15 years, and the sheer amount of information that has been made available is unprecedented. Unfortunately, often times the presenters and/or receivers of this information don’t have a technical background, and this resulted in designations and performance specifications being misunderstood, cross-decked between different missiles, or sometimes, just plain made up to fill in the gaps. Without realizing it, the majority of reporters and bloggers “spammed” the world with a multitude of inaccurate and confusing books, articles, and chat room entries. This article has attempted to sort the wheat from the chaff by looking at the available information through an engineering lens. A lot of the capabilities credited to the YJ-83 were just not technically feasible at the time of the missile’s development; it is an evolutionary weapon, not a quantum leap. 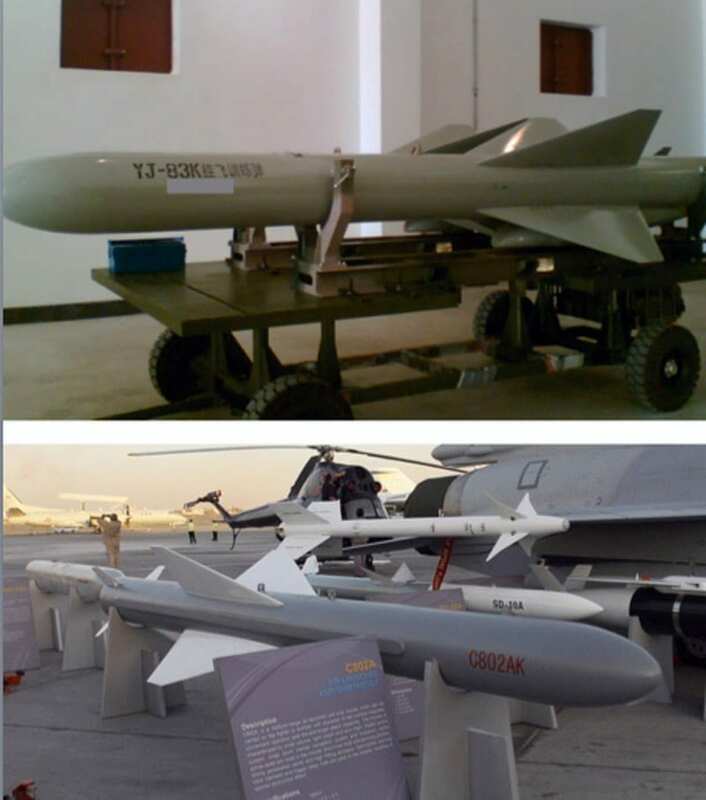 A good analogy would be if the YJ-8 is China’s MM38 Exocet, then the YJ-83 is China’s Harpoon Block 1C. This conclusion isn’t meant to be disparaging to China or Chinese engineers. On the contrary, they have made huge strides in a relatively short period of time. Granted, they’ve had a lot of help in the process, but the bottom line is that the PLAN has fielded a very capable missile, as well as a functional targeting system, that supports accurate over the horizon missile strikes against a potential adversary’s surface ships. Not many nations can say they have this capability. Barabanov, Mikhail., Vasiliy Kashin, and Konstantin Makienko. Shooting Star: China’s Military Machine in the 21st Century, East View Press, Minneapolis, 2012. Couhat, Jean Labayle, Bernard Prezelin, and A.D. Baker III. Combat Fleets of the World 1988/89, Naval Institute Press, Annapolis, 1988. Bernard Prezelin, and A.D. Baker III. Combat Fleets of the World 1995, Naval Institute Press, Annapolis, 1995. Cordesman, Anthony H., and Martin Kleiber. Chinese Military Modernization: Force Development and Strategic Capabilities, Center for Strategic and International Studies, Washington D.C., 2007. Erickson, Andrew S. and Lyle J. Goldstein. Ed, Chinese Aerospace Power: Evolving Maritime Roles, Naval Institute Press, Annapolis, 2011. Fels, Enrico, et al, Power in the 21st Century: International Security and International Political Economy in a Changing World, Springer-Verlag, Berlin, 2012. Fisher, Richard D, Jr. China’s Military Modernization: Building For Regional And Global Reach, Stanford University Press, Stanford, 2010. Fleeman, Eugene L. Tactical Missile Design, American Institute of Aeronautics and Astronautics, Reston, VA, 2001. Friedman, Norman. The Naval Institute Guide To World Naval Weapon Systems, Naval Institute Press, Annapolis, 1989. Friedman, Norman. The Naval Institute Guide To World Naval Weapon Systems 1991/92, Naval Institute Press, Annapolis, 1991. Friedman, Norman. The Naval Institute Guide To World Naval Weapon Systems: 1994 Update, Naval Institute Press, Annapolis, 1994. Friedman, Norman. The Naval Institute Guide To World Naval Weapon Systems 1997-1998, Naval Institute Press, Annapolis, 1987. Friedman, Norman. The Naval Institute Guide To World Naval Weapon System/ Fifth Editions, Naval Institute Press, Annapolis, 2006. Huenecke, Klaus. Modern Combat Aircraft Design, Naval Institute Press, Annapolis, 1987. Jane’s Air-Launched Weapons (Issues 19 – 24), Jane’s Information Group Limited, London, 1994 – 1996. Jane’s Air-Launched Weapons (Issue 36), Jane’s Information Group Limited, London, 2000. Jane’s Air-Launched Weapons (Issue 49), Jane’s Information Group Limited, London, 2007. IHS Jane’s Weapons: Air-Launched 2012-2013, Jane’s Information Group Limited, London, 2012. Jane’s Fighting Ships 1987-88, Jane’s Information Group Limited, London, 1987. Jane’s Fighting Ships 1988-89, Jane’s Information Group Limited, London, 1989. Jane’s Fighting Ships 1993-94, Jane’s Information Group Limited, London, 1993. Jane’s Naval Weapon Systems (Issues 15 – 31), Jane’s Information Group Limited, London, 1994 – 1999. Jane’s Naval Weapon Systems (Issue 33), Jane’s Information Group Limited, London, 2000. Jane’s Naval Weapon Systems (Issue 37), Jane’s Information Group Limited, London, 2002. Jane’s Naval Weapon Systems (Issue 49), Jane’s Information Group Limited, London, 2008. Jane’s Naval Weapon Systems (Issue 55), Jane’s Information Group Limited, London, 2011. IHS Jane’s Weapons: Naval 2012-2013, Jane’s Information Group Limited, London, 2012. Jane’s Strategic Weapon Systems (Issue 32), Jane’s Information Group Limited, London, 2000. Jane’s Strategic Weapon Systems (Issue 36), Jane’s Information Group Limited, London, 2002. Jane’s Strategic Weapon Systems (Issue 48), Jane’s Information Group Limited, London, 2008. Jane’s Weapon Systems 1984-85, Jane’s Publishing Company Limited, London, 1984. Jane’s Weapon Systems 1986-87, Jane’s Publishing Company Limited, London, 1986. Jane’s Weapon Systems 1988-89, Jane’s Publishing Company Limited, London, 1988. Timmerman, Kenneth R., Countdown to Crisis, Crown Publishing Group, 2006. “China Continues to Develop H6K Bombers.” Kanwa Intelligence Review, 30 July 2006. “China’s Export of Anti-Ship Missiles.” Kanwa Intelligence Review, 30 January – 13 February 2009. “China Shows More Ship-To-Ship Missiles.” Kanwa Intelligence Review, 01 – 31 March 2007. “Chinese Navy Upgrades FFGS.” Kanwa Intelligence Review, 10 October 2004. “Combat Performance Features of Type 054.” Kanwa Intelligence Review, 10 October 2003. “Developments of Naval Equipments.” Kanwa Intelligence Review, 10 July 2005. Hewson, Robert. “Dragon’s Teeth – Chinese Missiles Raise Their Game.” Jane’s Navy International, January/February 2007. “Integration of Russian, Chinese Data Link Technologies on PLAN Combatants.” Kanwa Intelligence Review, 10 June 2004. “More Details on F22P.” Kanwa Intelligence Review, 30 January 2005. Pan Wenlin, “Small Gas-turbine Unit and China’s Anti-ship Cruise Missile.” Shipborne Weapons (舰载武器), Volume 8, 2010. “Problems in PLA Navy’s Large Battleship Construction.” Kanwa Intelligence Review, 20 June 2005. Qiu Shanchang and Zhou Zhonglin, “China’s C801 Propulsion System.” Aerospace China, No 11, November 1991. JPRS Report, Science & Technology-China, JPRS-CST-92-006, 20 March 1992. “Shanghai Supplying 052B/C DDG Radomes.” Kanwa Intelligence Review, 10 September 2006. “The Big Gap: The Reality of China’s Military Strength vs Japanese Military Observer’s Analysis.” Kanwa Intelligence Review, 10 July 2005. Wang Wei, “Development of the PLA-Navy’s Anti-ship Missile .” Shipborne Weapons (舰载武器), Volume 5, 2008. Xie Huiqing, “Chinese Navy’s Antiship Missile Under Rapid Development.” Shipborne Weapons (舰载武器), Volume 1, 2008. Zhan Yougen, “C801 Missile Autopilot.” Aerospace China, No 11, November 1991. JPRS Report, Science & Technology-China, JPRS-CST-92-006, 20 March 1992. “Ballistic Missile Proliferation: An Emerging Threat 1992.” Chapter Seven: Aerodynamic Missiles, System Planning Corporation under contract with the Ballistic Missile Defense Organization (BMDO), 1993. Boyd, Dallas et al, “Advanced Technology Acquisition Strategy of the People’s Republic of China.” Defense Threat Reduction Agency, Report Number: ASCO 2010 021, September 2010. “China’s Proliferation of Weapons of Mass Destruction and Missiles: Current Policy Issues.” Congressional Research Service, Report 1B92056, May 16, 2001. Hallion, Richard P. et al, “The Chinese Air Force: Evolving Concepts, Roles, and Capabilities.” Center for the Study of Chinese Military Affairs, Institute for National Strategic Studies, National Defense University, October 2012. Kan, Shirely A. “China: Ballistic and Cruise Missiles.” Congressional Research Service, Updated August 10, 2000. Kan, Shirely A. “China’s Proliferation of Weapons of Mass Destruction and Missiles: Current Policy Issues.” Congressional Research Service, Updated October 30, 2001. Kurth, Guido and Christoph Bauer. “Air Intake Development for Supersonic Missiles.” 44th AIAA/ASME/SAE/ASEE Joint Propulsion Conference & Exhibit, 21-23 July 2008, Hartford, CT.
Gill, Bates and Tae-Ho Kim, “China’s Arms Acquisitions from Abroad: A Quest for Superb and Secret Weapons”, Oxford University Press, 1995. Laruelle, Gerard. “Air Intakes: Role, Constraints and Design.” 23rd Congress of International Council of the Aeronautical Sciences, 3-13 September 2002, Taranto Canada. Mederios, Evan S. et al. “A New Direction for China’s Defense Industry.” Project Air Force Study, RAND Corporation, 2005. “Military and Security Developments Involving the People’s Republic of China 2010.” Annual Report to Congress, Department of Defense, FY2010. “Military and Security Developments Involving the People’s Republic of China 2011.” Annual Report to Congress, Department of Defense, FY2011. “The People’s Liberation Army Navy: A Modern Navy with Chinese Characteristics.” Office of Naval Intelligence, August 2009. Rideau, Jean-Francois, et al. “Microturbo Families of Turbojet Engines for Missiles UAV’s: From the TR60 to the new bypass turbojet engine generations.” 44th AIAA/ASME/SAE/ASEE Joint Propulsion Conference & Exhibit, 21-23 July 2008, Hartford, CT.
Saunder, Phillip C. and Joshua K. Wiseman, “Buy, Build, or Steal: China’s Quest for Advanced Military Aviation Technologies.” Institute for National Security Studies, National Defense University, 2011. Xu Guozhen, “Adequate Utilization of GPS Resources to Promote the Development of China’s Aviation Industry.” China Astronautics and Missilery Abstracts, Volume 2, No 3, 1995. National Air Intelligence Center translation, NAIC-ID(RS)T-0059-96, 25 March 1996. Yung, Christopher D., “People’s War at Sea: Chinese Naval Power in the Twenty-First Century.” Center for Naval Analyses, March 1996. Although your article sought to dispel misunderstandings about this missile family, it likely does no better than propagating further misunderstandings with “speculations” and analysis “based largely on coincidental inference”, not just where you admitted their use in your discussion on the YJ-83 missile’s origins, but also in the overarching tone of your piece throughout. Speculations and coincidental inference can either be right, or spectacularly wrong, as anybody who has ever had analogous first-hand experience with both outcomes in mundane, daily life events can tell you. That much should be obvious. So it was surprising to me that, despite innumerable opportunities in the course of compiling so many words and paragraphs, you have not made a single mention of an equally possible alternative interpretation of the limited data available with regard to the origins of YJ-83 and others. The alternative interpretation is that China has consistently had a strategy of simultaneous domestic development running in parallel to attempts at foreign acquisitions, but independent from borrowing foreign technical designs, because they could not risk only counting on acquiring foreign designs when many of those past attempts had in fact proved to be unsuccessful either openly or clandestinely. Such an interpretation is well supported by the observable pattern of development for not just the YJ family of missiles, but also military systems across the board. Of course, the same pattern can equally support your version of speculation, which is to allege that either overt or elicit copying of foreign counterparts occurred in every instance. But I believe the alternative interpretation which I proposed here is more plausible and sensible, not only because it is less extreme in tone than yours, but also taking into account a wider sampling of evidence from sources in addition to yours. This does not preclude the likelihood that some weapons development did in fact have heavy foreign influences, but, unless and until disclosure of actual documentation on this topic occurs for the YJ missiles or any other technology, speculations do not advance understanding much in this regard. They are only self-serving. The alternative that I mentioned here is just as easy to contemplate or comprehend as the version that dominates your thinking. You were certainly free to choose the interpretation for any given event or set of events, but you had more than ample room in your verbose discussion to mention both, and should have, if you wanted your lengthy effort to have any credibility beyond preaching to the choir.